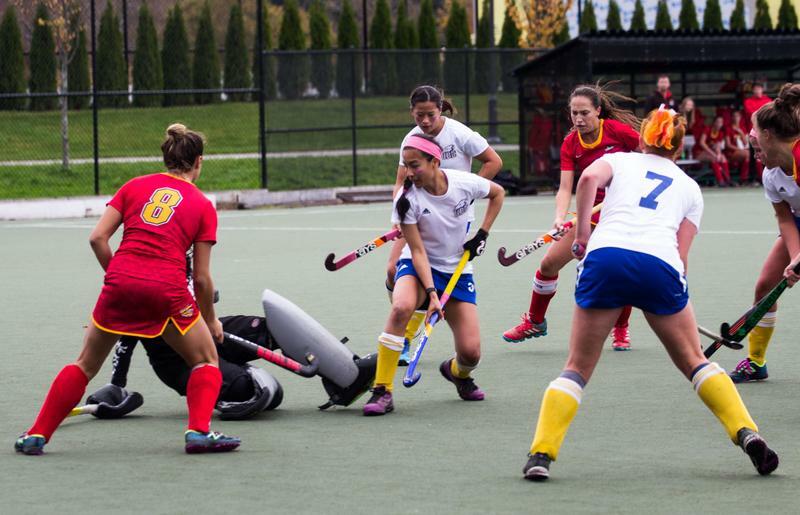 The Thunderbirds women’s field hockey team extended their unbeaten streak to 17 games with a 1-1 draw on Friday and 3-0 shutout win on Saturday against the University of Victoria Vikes. The last time the ’Birds lost a game was on November 5, 2015 during the CIS Championships when they fell 1-2 to the University of Guelph Gryphons. Friday’s game, a rematch of the U Sports final from last year, was closely fought between the veteran Thunderbirds and the young Vikes. The ’Birds took an early lead when fourth-year midfielder Emily Martin scored in the 28th minute. The ’Birds kept their lead throughout all of the first half and well into the second half until the Vikes responded with a goal of their own courtesy of Leina Dueck in the 62nd minute. The game, in which the Thunderbirds collected three penalty cards, would end in a tie. Veteran keeper Rowan Harris made four direct saves in the penalty filled game for the ’Birds. What was an extremely close matchup on Friday turned into the exact opposite on Saturday as the ’Birds shutout the Vikes 3-0. UBC came out swinging in the first half, scoring in the first minute thanks to second-year forward Abbey MacLellan. Midfielder Sarah Keglowitsch would add a goal of her own in the 58th minute and fifth-year midfielder/defender Meghan Hayden would make the tally 3-0 just five minutes later. Harris was solid in goal once again for the T-Birds, making seven saves in her first shutout of the season. Still the ’Birds were given two penalties in the game — keeping that number down will surely be something to work on before their next doubleheader series this weekend against the Dinos at the University of Calgary. It will be the second straight series on the road for the Thunderbirds. The ’Birds will then return to take on both the Vikes and the Dinos in separate doubleheaders in Vancouver at Wright Field. The ’Birds will play the Vikes on October 7 and 8, and the Dinos the weekend after. This year’s U Sports Championship series will also be held in Vancouver from November 2 to 5, 2017.